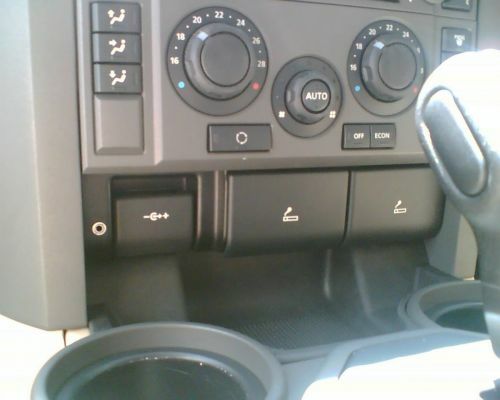 I've almost finished my custom installation of my ipod aux input jack, but cannot remove the lower section (12v aux power and ash tray), from the centre dash, just under the heater/aircon switches. See pic in my gallery. I've removed the 2 outer screws but it seems that the unit is held in place with clips or other hidden screws. Has anyone removed this before? What's the trick? Harry What's the point.... it all comes out in the wash anyway! Pull really hard! It is very well held in but it will come out eventually. Do you speak from experience? or are you just assuming that it will pop out without breaking? How did you get on? I'm looking to connect my ipod, and it seems ridiculous to have to run a cable to the aux plug on the back of the centre console storage box, so I'm looking for something better. What have you done? I had to take out the central consol (TR knob, gear shift lever part) to take out the blanking part which is between the ashtray and the center consol. The upper part of the blanking part is above the lower part of the ashtray, that is the reason why the ashtray cannot be removed (at least on my LHD German model). Also if your car is automatic, you have to be very careful with the cover for the gearlever, it is kept to the central consol by plastic clips (which I successfully broke when I tried to remove it). The GTR does not have the correct method to remove this either. Yes, I took mine out to fit the phone kit. You may find one of the metal clips pings off never to be seen again but it'll fit back in fine without it. I just followed cotefarmboy's post on iPod connections under tips and Tricks, but I did want to mount the 3.5mm jack neatly near the 12v aux outlet. I'll post pic's when done.. The 12v Aux /ashtray section will NOT come out without first removing the blanking plate below it (unless you intend break the centre clip holding the ashtray in place Yes that's right there are 3 nasty little clips and it seems that they are there to add tension to the centre of this plate so the little flaps on the lighter close properly???? ), and in order to remove the blanking plate you first need to remove the grey centre console surround without breaking the clips on the top near the centre console lid..... as AN so correctly stated. This is where I need HELP!! pleeeease! Has anyone ever done this before? I've searched the forum without finding a specific post relating to this. I am concerned if I go too far and start unclipping things, they'll break ( as they already have ) or I won't be able to re-assemble. This is a first for me, as a Mechanical Engineer I've nver been stumped like this before but now I'm desperate. .. This is very difficult to describe it, but I will try to do it. The auto gearshift cover has 4 little plastic arms which slopes and there is 4 plastic hangers on the gray surround (which has TR knob, height and transfer box switches), you have to guide those arms to the hangers and they will "click in". The gray suround has 3 clips in the front part, which clips it to the central consol upper part, this is clipped to the lower part by 8 clips (has to be pushed to places, there is metal clips in the plastic lower part, which can come out). First put back the central consol upper part, put the gear lever part under the gray surround and after that try to clip the gear lever part to the gray surround. Part of the gear lever part goes under the central consol, thus when you put everything together, you have around 3/4 inch space between the gear lever part and the gray sorround to work with, when you try to guide the little arms back to the hangers. Not sure if you have to do all that. I've had my centre console out a couple of times, and that of my buddy Chris Tyler. Do a search on his posts, I think he posted pictures of it all out. Its a lot easier to get the ashtray panel out if you previously remove the hazard button panel, the radio and the environment control panel. The ashtray itself is held in by two clips which go in opposite directions, hence its very difficult to get it out. But removing the above items helps. To remove the centre console (back to the box) first remove the rubber coin tray, then the screw holding the parking brake and the one under the sunglass holder. Unplug and remove the parking brake. Then grasp the edges of the upper part of the centre console and pull up! As usual there are a few clips, but it will come up in the end, held only by the wiring plugs for the terrain control and the gear knob. To completely remove the console you have to remove the gear knob (pull down the lower cover under the knob then prise the clips outward while pulling knob up) and unclip the cables. Careful of the cupholder inners, they sometimes become unattached, as there is a clip in their base. 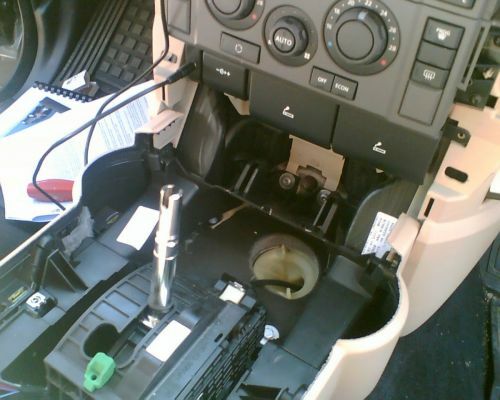 But they can be reattached to the centre console when its out and pressed back into place. Mail me if you need more info. I've had these apart too many times now! Well I've finally completed ... what started out as a simple project a few months ago. With the help of many forum members and the aid of the GTR manual (best $12 bucks I ever spent! 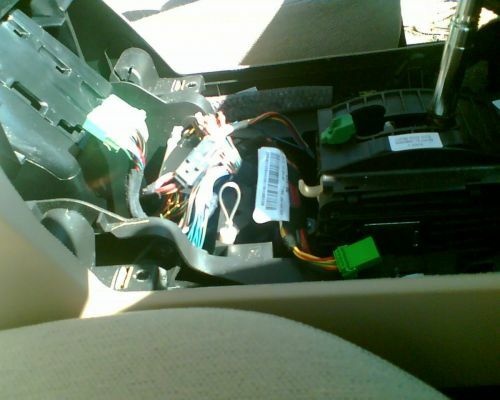 ), I was able to remove the centre console and ashtray section and complete the aux input for my Ipod! For the record.. the removal of the gear lever, surround and everything else is quite straightforward. The difficuly remains in removing the ashtray panel (the removal of the 3 clips) and knowing that the centre console plastic surround (cup holders and gear lever) must be removed first. 9unless you plan on breaking it. As an expert in this field, I am happy to share my knowledge if anyone else has problems with the centre console. Some pic's of the journey and the final product. (I'll post in my gallery if these pic's don't load). Don't forget to re-insert the handbrake cable in the guide, (especially if you lift the console from the cubby box end). Now to drive and enjoy! Cheers and thanks to those that offered advice.. What's the point.... it all comes out in the wash anyway! 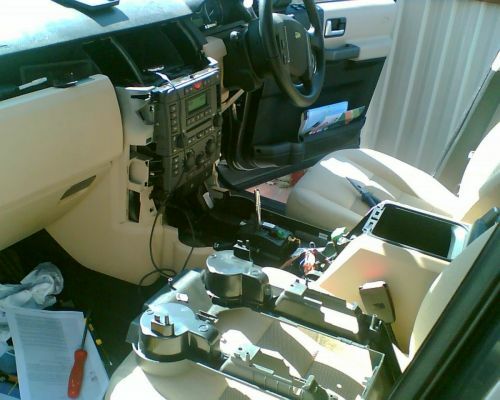 I'm just in the process of removing the centre console but having some problems. the handbrake release cable sits in a guide close to the EPB switch. make sure it goes back there when you re-install everything. As far as I can remember the blanking plate under the 12v panel needs to come out first before the panel can come out. Can you post a pic of what you're up to? Cheers What's the point.... it all comes out in the wash anyway!